Although the 1925 exposition, the International Exhibition of Modern Decorative and Industrial Arts, introduced a style for modern design, later known as “art deco,” was enormously successful, unlike other exhibitions, no significant building was left behind. No Palais du Trocadéro from 1878, no Eiffel Tower from 1889, no Grand Palais from 1900–nothing more than a pleasant memory of showing the world that France still dominated in the visual arts. When the planning began for the next world’s fair, scheduled for 1936, but delayed until 1937, architecture was of primary concern. This fair, like its predecessors, had to leave behind a significant legacy. However, the theme for the exposition–modernity–proved to be challenging, raising the question: was France ready for modern architecture? At first, the architects summoned to compete in the early 1930s thought ambitiously, in terms of urban renewal, with the hope of extending and updating the infamous Haussmannization of Paris, which began in the 1860s. The Swiss architect Le Corbusier, long a resident of Paris and famous, was disqualified from the competition because he missed the deadline and submitted his proposal with his name on it–a violation of the rules. According to Rika Devos and Alexander Ortenberg in their book, Architecture of Great Expositions 1937-1959: Messages of Peace, Images of War, Corbusier wanted to shift the discussion away from a modern “style” to a modern “way of life” that would center on the home itself and how modern people lived in modern ways. In that same year, 1933, the architect would publish Ville Radieuse in which he wrote, “The city of today is a dying thing because its planning is not in the proportion of geometrical one fourth. The result of a true geometrical layout is repetition, The result of repetition is a standard. The perfect form.” The competition moved on without considering his question of life in a modern city and the idea of demolishing large sections of Paris was scaled down and the venerable architect Auguste Perret was given the task of coming up with a solution. Perret wanted to do some tearing down of his own and he, too, dreamed of being Haussmann. “Yes, I pull down the Trocadéro, the sad remains of the 1878 exhibition. Yes, I eliminate the barracks of the École Militaire, which block the fine Gabriel façade. 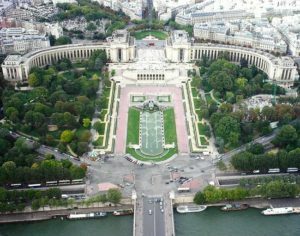 And this is what I replace them with: the Trocadéro become a Palais where all the large museums scattered about in Paris are centralized.” Everything seemed on track, but a year later in 1934, fascist riots disturbed the city and the exhibition was canceled. Artists and architects protested and managed to get the exposition back on track, but without the ambitious plans for urban renewal. Available space would be repurposed and all of the exciting ideas for modern architecture of glass and steel boiled down to rebuilding Perret’s original target: the Trocadéro. But a new name rose to the top: Jacques Carlu. The old Trocadéro consisted of a central building, rather exotic eclectic roundish structure, flanked by a pair of curving wings, rather like St. Peter’s Cathedral in Rome. There had been plans to disguise this “belly” of the structure with a concealing container that was more “modern,” and there were ideas of demolition. The French immediately became protective of the Trocadéro. As Julia Kostova, author of Spectacles of Modernity: Anxiety and Contradiction at the Interwar Paris Fair of 1925, 1931, and 1937, said, “While not liking the old Troca in the first place, Paris was not ready to let go of it, bespeaking the disquiet modernity inspired. This sharply critical response further problematized France’s relationship to its past and its attitude toward modernity.” The architect proposed to “preserve a part from the old structure but to clad it with marble, and to gut out and renovate the other part.” While the Place de Trocadéro was named after a famous battle with Spain in 1832, the Palais de Chaillot was named after a medieval town of the same name. The Exposition did not open until 1937 but historian Jay Winter in his book Dreams of Peace and Freedom: Utopian Moments in the Twentieth Century noted that the city covered up for the delay by pairing 1937 to 1837 when the first train traveled between Paris and Saint-Germain, and 1637 when Descartes published his Discours sur la méthode. To celebrate the triumph of science, the ashes of the philosopher were transferred to the Pantheon in the closing ceremonies. The classicism of the new Palais de Chaillot and its tentative attempts at renewal made the gesture of the rejected architect, Le Corbusier, all the more significant in that modernity and the modern in architecture never materialized at the Fair of 1937. 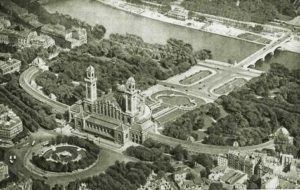 Aside from the renewal of the Trocadéro, France did not produce any major modern buildings and most of the pavilions were scattered across the fairgrounds and only a few, such as the Palace of Discovery survived. 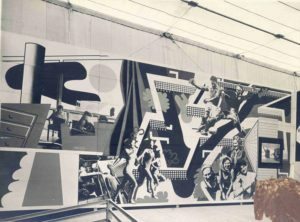 The next post will discuss the work of the Delaunays on their murals at the 1937 Fair.